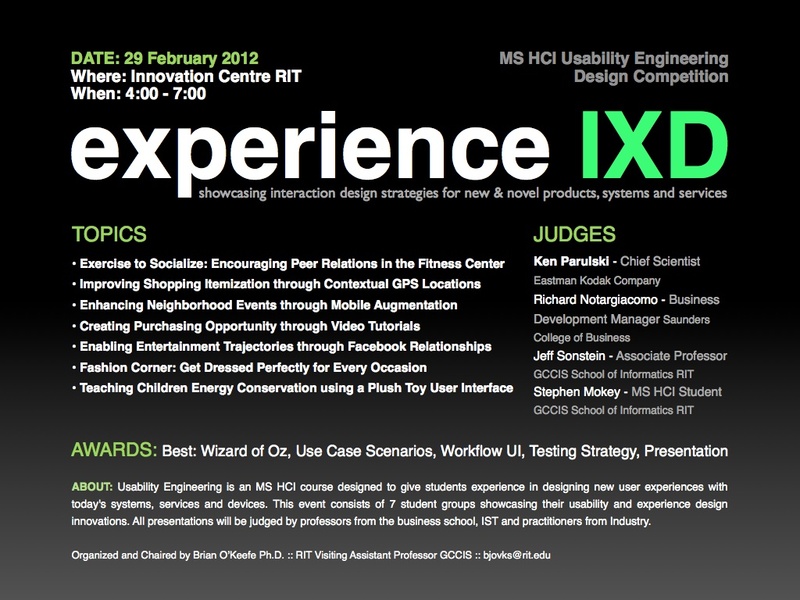 I am happy to announce Experience IXD at the Rochester Institute of Technology Innovation Center on 2.29.12 from 4:00pm to 7:00pm EST. All are welcome. This judged event will show case MS HCI student interaction design strategies for new & novel products, systems and services. The panel of judges are from Eastman Kodak, the Saunders Business School and the School of Informatics and Technologies at Rochester Institute of Technology. I am very happy to have had the chance to work with these MS students, create this event and redesign the course ‘Usability Engineering’ at RIT. The event will be recorded.